Over the course of many years, as a teacher, scholar, and friend, Ruth Zimmerling has impressed on me the importance of precisely defining one’s concepts. After all, if there is no agreement on the intension and extension of a concept, it is impossible “to assess the truth or falsity or, more generally, the correctness or incorrectness, of propositions, hypotheses or theories” (Zimmerling, 2005, p. 15). The statement is almost self-evident: Without precisely defined concepts, the whole endeavour of science becomes pointless, and scholarly discourses are bound to turn into dialogues of the deaf. In her magisterial monograph, before she moves on to dissect and then reassemble the concepts of power and influence in a bid to clean up the mess that others have left, almost en passant Ruth makes a couple of important observations. First, she notes that in everyday situations, all of use words which lack clear definitions, yet most of the time, we are able to communicate “reasonably well” (Zimmerling, 2005, p. 15). Although “we must do better than just understand each other reasonably well” (Zimmerling, 2005, p. 15) in the realm of science, one unspoken implication is that the difference between scientific language and everyday language is often a gradual one. Second, she coins the notion of the “bicycle concept”: a concept “which is unproblematic as long as one does not stop to think about how exactly it works” (Zimmerling, 2005, p. 15). While it would be difficult to disagree with Ruth’s plea for conceptual clarity on a general level, I think that, at least for the sake of an argument, it is possible to read these two observations against the grain. Unlike Ruth, I would like to argue that “bicycle concepts” can have their virtues (even if they might sometimes land one “flat on one’s face”): The very shininess of bicycle concepts may stimulate discourses by attracting new scholars to an emerging field, whereas their inherent flexibility and agility facilitates movement across disciplinary boundaries. It clusters not around one, but several bicycle concepts. It cannot even agree on the most appropriate label for the core bicycle concept that defines the field: is it the “extreme”, “radical”, “far”, “populist”, “anti-immigrant”, or “new” right? It consciously abandoned conceptual reflection in favour of empiricism, then, a decade later, relatively quickly adopted a very specific (and highly useful) set of definitions, both under the influence of a single scholar. My analysis is largely exploratory, probably affected by selection bias, and relies on messy data. Even worse, I may not have too clear a concept of “progress”. This irony is not entirely lost on me. Extremism and radicalism are venerable concepts in Political Science. Their long and convoluted history has been explored in detail elsewhere (Backes, 1989, 2007; Lipset & Raab, 1971). In postwar Europe, their use was confined to organisations at the very margins of the political spectrum and their supporters – communists of different strands on the one hand and right-wing parties and movements that harked back to the authoritarianism of the interwar period on the other. However, in the late 1970s and early 1980s, an apparently new party family that was not easily classified as extremist rose to prominence in Western Europe. While some of its putative members were connected to traditional right-wing extremism through their history, ideology, and membership, others were unencumbered by such political baggage (the Danish and the Norwegian Progress Parties in particular, see Svåsand (1998)). More importantly, not a single one of the electorally relevant members of this family campaigned to replace democracy with some authoritarian alternative, and very few openly espoused traditional biological racism or antisemitism (although more covert references are not so unusual). Some of this parties such as the Dutch LPF and PVV or the Norwegian FrP even argue, in sharp contrast to traditional right-wing positions, that they are defenders of the rights of sexual minorities. What ultimately unites these parties (at least since the early 1980s) is their sharp opposition to non-Western immigration on the one hand and their problematic and ambivalent relationship with liberal democracy on the other (Arzheimer, 2008, Chapter 1.2.4): While they claim to be champions of some aspects of European democracy such as majority rule and freedom of speech (at least where it favours their own interests), they are highly sceptical of others (minority rights, representation, deliberation). The early successes of these parties were sometimes mistaken as a return of interwar right-wing extremism (see Hagtvet (1994) for an example), but more often, they were perceived as worrying in their own right. Both perspectives have certainly contributed to the enormous and perhaps disproportionate (Mudde, 2013, p. 2) scholarly attention the phenomenon has received over the last three decades or so. Mudde’s claim that “more than a hundred scholars from across the globe work on the topic” (Mudde, 2013, p. 2) is an understatement – “several hundreds of scholars” (counting PhD students, PostDocs and established researchers) would be a more realistic assessment. Their work spans various subfields, most notably party and party system research and voting behaviour, but also political communication, political economy, political psychology, and several others. It is also interdisciplinary: while most scholars in the field are political scientists or sociologists by training and affiliation, contributions have also come from economy, psychology, history, and education. A sizeable part of this research is documented in an extensive bibliography on the field that I maintain. This bibliography began as a list of references that I had perused in my own work from the 1990s up to and including my 2009 monograph on the electorate of these parties. Since 2010, the bibliography has been publically accessible on the internet (https://www.kai-arzheimer.com/extreme-right-western-europe-bibliography). Every six to eight months it is updated, using input from content databases and journals on the one hand and colleagues on the other. At the time of writing (January 2018), the bibliography contains 659 titles: 98 books, 121 chapters, and 439 articles from learned journals. However, this literature’s disciplinary and conceptual diversity is often seen as problematic. As early as 1989, Uwe Backes bemoaned the “confusion of tongues” in the (much more narrowly defined) field of (German) research into right-wing extremism (Backes, 1989, p. 33). Reflecting on this observation and various other attempts to bring more conceptual clarity to the field, Cas Mudde wrote seven years later: “In 26 definitions of right-wing extremism that are used in the literature, no less then 58 different features are mentioned at least once. Only five features are mentioned, in one form or another, by at least half of the authors…” (Mudde, 1996, p. 229). In this short contribution, I will focus only on the most obvious conceptual problem, namely the disagreement over a proper label for the field’s “core bicycle concept”. I will argue that this confusion has not prevented the emergence of large body of scholarship on the subject, and, more importantly, that this scholarship displays a high degree of interconnectivity and has not degenerated into a dialogue of the deaf. The main advantage of using my own bibliography is that is shaped by my attempts to consciously identify a coherent (yet diverse) research community and its outputs. While I hope that the result contains much of the relevant research on the topic, it is important to point out some serious limitations and biases. First, the bibliography’s substantive focus is on electorally relevant parties and their voters in Western Europe. Social movements and fringe parties, as well as Central and Eastern Europe get some coverage too, but in a much less comprehensive manner. Other geographical regions (North America in particular) are hardly represented at all when it comes to parties and voters, whereas research on potential antecedents and consequences (attitudes towards immigrants and even attitudes of immigrants) may be included, irrespective of the country on which the research was conducted. Second, the bibliography contains just under ten per cent sources that are written in German, with the rest almost exclusively in English. Literature in other potentially relevant languages (in particular French and Italian) is neglected. For the analyses here, all sources in other languages than English are consciously excluded. Third, the bibliography leans towards publications in peer-reviewed journals. While this is in line with developments in the field, and in Political Science more general, it still constitutes a source of bias. Finally, what is essentially a one-person endeavour can never compete with comparable commercial or institutional databases and will always be shaped by the authors personal preferences and prejudices. To offset these problems, I will also make use of a commercial reference database (Web of Science/Social Science Citation Index). These sources have some problems of their own. The bias towards English-language sources and towards (certain) peer-reviewed journals is even more pronounced. Also, the selection of references pertaining to a subfield is largely driven by simple keyword searches, not by human expertise. On the other hand, the commercial nature of these databases means that conditional on these limitations, they provide unrivalled coverage of the literature. Moreover (again, within these limits), they provide the data necessary for bibliometric analyses. Two phrases stand out: “Radical Right” and “Extreme Right” collectively show up in the titles and abstracts of nearly half of the items in the bibliography, whereas all other phrases are present in less than ten per cent of all items, respectively. The reminder of the analysis will there focus on the prominence and conceptual quality of the “radical” vs “extreme” distinction. While the findings in Table [phrases-table] suggest the “Extreme Right” and “Radical Right” are more or less equally prominent in the literature, even a cursory glance at some of the landmark studies in the field suggests that their respective popularity may have waxed and waned over time. “Right-Wing Extremism in Western Europe” (Beyme, 1988) is one of the first edited volumes that reflected on the electoral mobilisation at the right end of the ideological spectrum in 1980s Western Europe. For von Beyme and his contributors, the rise of new or newly transformed parties at the very margins of the European party systems represented nothing less than a “third wave” (after the 1920s/30s and the 1950s/60s) of traditional right-wing extremism, which they addressed using the tools provided by the existing European (and largely German) research into extremist attitudes, ideologies, and behaviours. Similarly, an influential article by Piero Ignazi in the European Journal for Political Research (Ignazi, 1992) provided a (then) new explanation (backlash against the “New Politics” of the 1960s and 1970s and their proponents) for the rise of these parties but also classified them as “extremist”, i.e. fundamentally opposed to liberal democracy. In this vein, “Extreme Right” became a convenient shorthand for a supposed family of parties to the right of the established Conservative and Christian Democracts (see e.g. Hainsworth (1992, 2008, 2000; Merkl & Weinberg, 1997, 2003)), even if their exact relationship with democracy was less clear-cut than the label extrem[e|ist] would suggest. Some intellectual justification for this perhaps questionable practice came from a selective reading of Cas Mudde’s classic 1996 article in the European Journal for Political Research on the problems of defining the Extreme Right party family (Mudde, 1996). In this article, after a painstaking analysis of possible criteria for membership and their respective problems and shortcomings, Mudde remarks (paraphrasing a similar observation by von Beyme) that these definitional problems are of limited relevance for the practice of research, because there is almost universal agreement amongst on which parties should be classified as members of the Extreme Right (Mudde, 1996, p. 233). Many authors took this statement as a licence for definition by (collective) fiat. However, around the same time, two monographs that had a substantial impact on the further development of the field were published: Hans-Georg Betz’s “Radical Right-Wing Populism in Western Europe” (Betz, 1994) and Herbert Kitschelt’s “The Radical Right in Western Europe” (Kitschelt, 1995). Both authors were influenced by Daniel Bell’s classic monograph on the Radical Right in the US (Bell, 2002)3, and both authors highlighted the internal diversity of the party family and how at least some of their members differed from traditional right-wing extremism. These monographs signify the emergence of a second stream in the literature that emphasises the relative newness of the parties under study. Even so, within both streams scholars analysed the same set of parties and their voters. The question of how separate these streams are will be addressed in the next section, using commercial bibliographical data. Anecdotal evidence suggests that most authors working in the field were “users” rather than “producers” of concepts: they were more interested in applying concepts to substantive problems than in developing them further and could switch effortlessly from studying the “Extreme Right” to work on the “Radical Right” (and back), depending on external factors such as the preferences of conference organisers, co-authors, and reviewers. This is readily illustrated by the titles of a series of volumes edited by Peter Merkl and Leonard Weinberg: Against the general trend (see below), they shifted from “Encounters with the Contemporary Radical Right” (Merkl & Weinberg, 1993) to “The Revival of Right-Wing Extremism in the 90s” (Merkl & Weinberg, 1997) and “Right-Wing Extremism in the Twenty-First Century” (Merkl & Weinberg, 2003), while most contributions in the latter books (including those written by the editors) still use the “Radical Right” label. The publication of Cas Mudde’s 2007 monograph on “Populist Radical Right Parties in Europe” (Mudde, 2007), however, marked a turning point. Mudde is one of the most productive authors in the field in general and had been one of the most nuanced and thoughtful proponents of the “Extreme Right” school in particular. But in the first chapter of this new book, he proposed a new typology that represents a break from his earlier work (in particular from Mudde (1996) and Mudde (2000)) and aims at establishing a clear, hierarchical relationship between the most prominent adjectives used in the field. For Mudde (2007), the most general definition of the Radical Right party family includes only two elements: “nativism” (a combination of nationalism and xenophobia that implies that non-native elements – persons and ideas – represent a fundamental threat to the homogeneous nation state, see Mudde (2007, p. 19)) and “authoritarianism” in the sense of Altemeyer (1981), i.e. a highly conventional, aggressive, but not necessarily anti-democratic view of society. For Mudde, most (but by no means all) Radical Right parties are also “populist” in a very specific sense of the word: By populism, he means a “thin ideology” (Stanley, 2008) that pits “the pure people” against a “corrupt elite” (Mudde, 2007, p. 23) in the broadest sense and must be filled with more specific ideological content. Finally, a small subgroup within the Radical Right, which Mudde labels as the “Extreme Right”, openly oppose democracy Mudde (2007, p. 23). Mudde’s typology is not without its own problems. (Right-wing) authoritarianism is a notoriously vague concept, and nativist and authoritarian tendencies are also found in established parties, particularly though not exclusively in (non-radical) parties of the right. Where and how does one draw the border? One the other hand, Mudde brings together three of the most prominent terms used in the literature in a way that is internally consistent and, in the view of many applied researchers, adequately captures empirical differences between the very many European right-wing parties. Consequently, the impact of his monograph on the field can hardly be overestimated.4. Can these intellectual developments be quantified? Figure [fig-er-rr-timeseries] suggests that this is indeed the case. 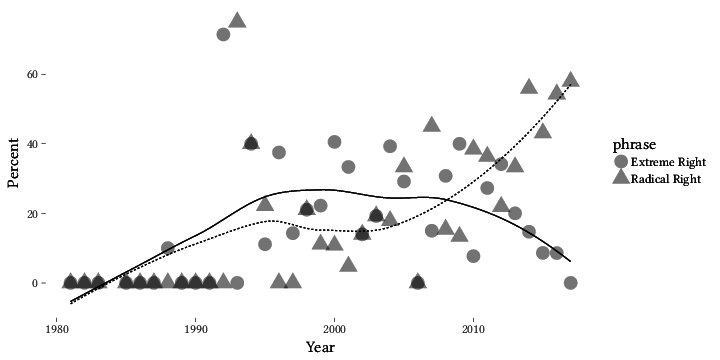 For each year from 1980 to 2017 (inclusive), the square and triangular markers represent the share of publications that use the respective phrase. Because the average number of publications per year is relatively low (1.3), these numbers fluctuate wildly, and so the superimposed non-linear trends better represent developments over time.5 The resulting picture is clear. During the 1980s, both phrases were used rarely, and from the 1990s into the early 2000s, “Extreme Right” had a slight lead over “Radical Right”. Following the publication of Mudde’s 2007 monograph, this began to change rapidly as can be gleaned from the rightmost part of the graph. For the whole decade from 2008 to 2017, the use of “Radical Right” outnumbers the use of “Extreme Right” by a factor of 2.2, and during the second half of that decade, the use of “Extreme Right” has become (increasingly) rare. Obviously, using a phrase (albeit in a prominent position) does not necessarily imply a serious conceptual commitment, and where it does, the underlying conceptual framework is not necessarily Mudde’s. Nonetheless, it seems safe to assume that the field has overcome its most blatant shortcoming: the inability to agree on a common label for the phenomenon that scholars are studying. To get a more rounded view of the field by digging into the relationships amongst authors and concepts, it is necessary to make additional use of commercial bibliographic data sources such as the Social Science Citation Index (SSCI).6 Relying on the SSCI implies some serious limitations. First, the index’s coverage is limited to a select group of journals in principle, while in practice criteria for inclusion are somewhat more vague, and the index may also include conference proceedings and other material. Second, whereas the bibliography is consciously limited to the Extreme/Radical Right in Europe, there are no reliable means for limiting the geographical scope of an SSCI query. Third, such querys are entirely key-word based and may return items which belong into the general domain of social science research but are not at all related to the research question at hand. Bearing these limitations in mind, two separate queries for the phrases “Radical Right” and “Extreme Right” were run on the SSCI for the 1980-2017 period using the “TS” operator, which will return hits on the title, abstract, and keyword fields of the database. As of January 2018, the first query returns 596 hits, and the second query returns 551. By and large, this confirms the findings on their relative importance reported in the previous section. Also in line with these findings is the relatively low degree of overlap in the use of both phrases: A search for “Extreme OR Radical Right” returns 1,015 hits, implying that only 132 items use both phrases. To make the data more comparable, this list was further restricted to journal articles (745) and book chapters (3), excluding a surprisingly large number of book reviews (220) and other documents. A cursory glance at the titles of the remaining items identified about 20 unrelated articles, chiefly from the fields of brain research, motor-perception research, and genetics, which were removed. The key advantage of using these data is that the SSCI records all the sources that each item on the database cites, including (most) titles which are themselves not covered by the SSCI. The analysis presented in Table [most-cited-in-ssrc] also confirms the dominant position of Mudde’s 2007 book: It is the most cited and at the same time the youngest item on the list, surpassing the much older mongraphs by Kitschelt (1995) and Betz (1994). Put differently, roughly every third of the 552 articles published after 2007 cites this book. Two other monographs are also frequently cited but appreciably less popular than the books by Betz, Kitschelt, and Mudde: Pippa Norris’s comparative study (Norris, 2005), embraces the “Radical Right” moniker and occasionally uses “extreme” either as a synonym or to refer to particularly problematic parties. Her main criterion for inclusion in the party family is the extremity of the parties’ political positions as measured by expert surveys. Elisabeth Carter (Carter, 2005), on the other hand, assumes that the parties covered by her study are all right-wing extremist. She uses three criteria – the party’s position towards immigration, racism and liberal democracy – to further subdivide the Extreme Right. The five other items are journal articles with a primarily empirical outlook that lack conceptual ambitions. Golder (2003, p. 443) distinguishes between “older, neofascist parties and more recent, populist parties on the extreme right”. While he highlights their diverging electoral fortunes, the discussion of the criteria he employs is rather brief (Golder, 2003, pp. 446–447). R.W. Jackman & Volpert (1996) acknowledge a similar distinction7 but, like Carter (2005), assume that the parties they study are primarily right-wing extremist. Lubbers et al. (2002) and Arzheimer & Carter (2006) take the “Extreme Right” label for granted, whereas Brug et al. (2005) focus on the parties’ anti-immigrant message and use “radical”, “extreme”, and other labels interchangeably. Collectively, these findings suggest that the “Extreme Right” label lacked a strong proponent, or at least a strong proponent that was widely received in the literature.8 Once someone presented a clear rationale for using the “Radical Right” label instead, many scholars were willing to jump ship. If this was indeed the case, the literature should display a low degree of separation by the respective labels. One straightforward way of addressing this question is the analysis of co-citation patterns (Small, 1973). “Co-citation” simply means that two publications are both cited by some later source. By definition, a co-citations represent a view on the older literature as it is expressed in a newer publication. Each time two titles E and R, which respectively use the labels “Extreme” and “Radical”, are both cited in some later publication P, this is a small piece of evidence that the literature has not split into two isolated streams. To get a handle on this unwieldy co-citation network, the twenty publications with the biggest total number of co-citations and their interconnections were extracted. Many of them are familiar, because the most-cited sources from Table [most-cited-in-ssrc] are all included in this group (see Table [top-twenty-co-cited]). From the middle column of this table, it can also be seen that co-citations within the group are frequent. These titles represent something like the intellectual backbone of ERRS. But which titles are cited together? 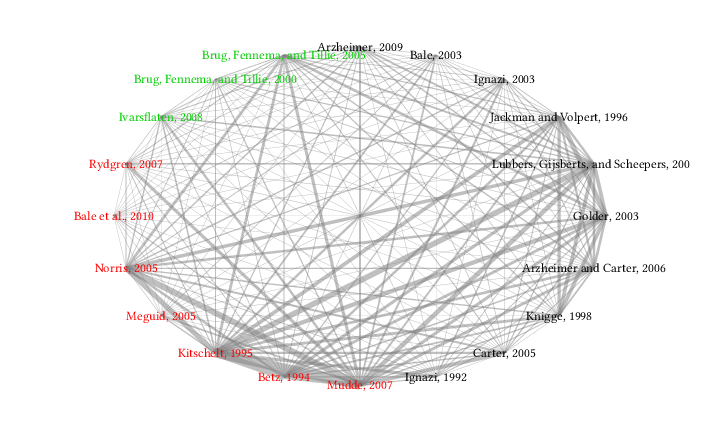 Figure [fig-network] depicts the top-20 co-citation network. The titles are arranged in groups, with proponents of the “Extreme Right” on the right side of the graph, authors using the “Radical Right” label in the lower-left quadrant, and a small group that is committed to neither label in the upper-left corner. The width of the lines is proportional to the number of co-citations connecting the titles. The most obvious finding from Figure [fig-network] is that the network is almost complete: Apart from the missing link between Knigge (1998) and Bale et al. (2010), each title is connected to all other texts by co-citations. This already suggests that the field has not split into incompatible schools. Moreover, there are some very strong ties that bridge the supposed intellectual cleavages, e.g. between Kitschelt (1995) and Lubbers et al. (2002), between Lubbers et al. (2002) and Norris (2005), or between Kitschelt (1995) and Golder (2003). Intuitively, it would seem as if co-citations were chiefly driven by the general prominence of the titles involved, whereas the use of compatible terminology seems to play a minor role. This intuition can be formalised and statistically tested by means of an appropriate regression model. In Table [regression-table], for each dyad in the top-20 titles the number of co-citations was regressed on a) the sum of their respective co-citations outside the top-20 as a rough measure of the general popularity and compatibility of the two titles involved and b) the use of identical or diverging terminology. The coefficients refer to the linear-additive parameterisation of the model, which gives a sense of the direction of the effects but not much more. By exponentiating them, the model can be transformed to a multiplicative form, which is somewhat more accessible, but nonlinear: The model constant (2.852) is the natural log of the expected number of co-citations for two titles that use diverging terminology and have no external co-citations (a very unlikely scenario). By exponentiating this number, the expected co-citations can are obtained exp(2.852)≈17. By the same logic, exponentiating the coefficient for using the same terminology (0.424) yields ≈ 1.53: Holding everything else constant, co-citations are 53 per cent more likely if two works use the same terminology. The effect of the sum of external co-citations as a measure of general popularity is also positive, but very small (0.00038). 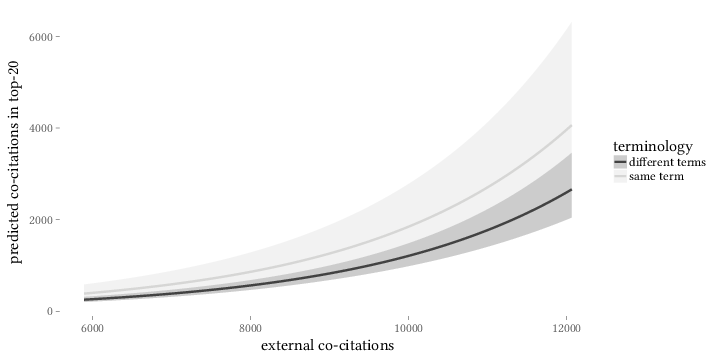 Exponentiating shows that each additional external co-citation is equivalent to an increase of 0.038 per cent in the count of internal co-citation. One must, however, keep in mind that each of these 20 titles has thousands of external co-citations, and that the variation in this count is in the thousands, too. Because of this wide variation in the range and distribution of the independent variables on the one hand, and because of the non-linear nature of the model on the other, plotting the expected counts against a range of plausible values12 for the number of co-citations gives a much clearer idea of what these findings mean in substantive terms. As can be seen in Figure [fig-margins-terminology], the expected number of co-citations is largely unaffected by the question of terminology for works that have between 6,000 and 8,000 external co-citations. From this point on, the expected number of co-citations grows somewhat more quickly for dyads that share the same terminology. 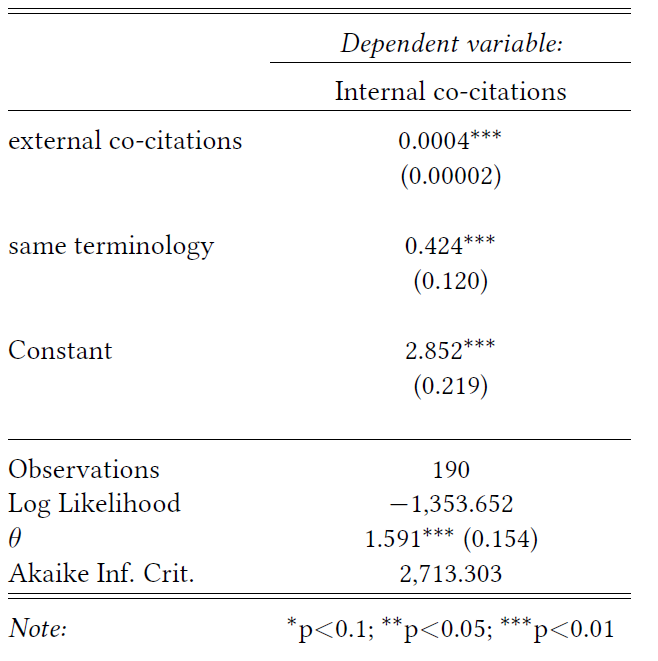 However, over the whole range of 6,000 to 12,000 external co-citations, the confidence intervals overlap and so this difference is not statistically significant.13 Put differently: Unless two titles have a very high number of external co-citations, the probability of them being both cited in a third work does not depend on the terminology they use, and even for the (few) heavily cited works, the evidence is insufficient to reject the null hypothesis that terminology makes no difference. While the analysis is confined to the relationships between just 20 titles, it can be argued that these titles matter most, because they form the core of ERRS. If we cannot find separation here, that does not necessarily mean that it does not happen elsewhere, but if happens elsewhere, that is much less relevant. For better or worse, European Radical Right studies have thrived over the last three decades, although for a long time, the subfield could not even agree on the name of its core concept. While the analysis in this chapter is seriously limited by a number of shortcomings – choice of a perhaps unusual subfield, focus on a mere label and purely quantitative and somewhat mechanistic methods of analyses, idiosyncratic underlying assumptions – this suggests that “bicycle concepts” may have their virtues: They are inherently flexible and can attract new scholars to a field. Importantly, however, many scholars in the field recognised the need for a clear(er) concept and were all to willing to replace their favourite bicycle with something that was at least slightly more stable and much better understood. This suggests that “bicycle concepts” are most useful in emerging domains of research. Once a subfield becomes established, we must indeed “do better than just understand each other reasonably well” (Zimmerling, 2005, p. 15). Altemeyer, B. (1981). Right-wing authoritarianism. Winnipeg: The University of Manitoba Press. Arzheimer, K. (2008). Die wähler der extremen rechten 1980-2002. Wiesbaden: VS Verlag für Sozialwissenschaften. Arzheimer, K. (2009). Contextual factors and the extreme right vote in western europe, 1980-2002. American Journal of Political Science 53(2): 259–275. Arzheimer, K. & Carter, E. (2006). Political opportunity structures and right-wing extremist party success. European Journal of Political Research 45: 419–443. Backes, U. (1989). Politischer extremismus in demokratischen verfassungsstaaten. elemente einer normativen rahmentheorie. Opladen: Westdeutscher Verlag. Backes, U. (2007). Meaning and forms of political extremism in past and present. Central European Political Studies Review 9(4): 242–262. Bale, T. (2003). Cinderella and her ugly sisters: The mainstream and extreme right in europe’s bipolarising party systems. West European Politics 26: 67–90. Bale, T., Green-Pedersen, C., Krouwel, A. & Luther, K.R. (2010). If you can’t beat them, join them? Explaining social democratic responses to the challenge from the populist radical right in western europe. Political Studies 58(3): 410–426. Bell, D. (ed.). (2002). The radical right. third edition. with a new introduction by david plotke. New Brunswick: Transaction Publishers. Betz, H.-G. (1994). Radical right-wing populism in western europe. Houndmills, London: Macmillan. Beyme, K. (ed.). (1988). Right-wing extremism in western europe. London: Frank Cass. Brug, W. van der, Fennema, M. & Tillie, J. (2000). Anti-immigrant parties in europe: Ideological or protest vote? European Journal of Political Research 37(1): 77–102. Brug, W. van der, Fennema, M. & Tillie, J. (2005). Why some anti-immigrant parties fail and others succeed. a two-step model of aggregate electoral support. Comparative Political Studies 38: 537–573. Carter, E. (2005). The extreme right in western europe. Manchester, New York: Manchester University Press. Golder, M. (2003). Explaining variation in the success of extreme right parties in western europe. Comparative Political Studies 36(4): 432–466. Hagtvet, B. (1994). Right-wing extremism in europe. Journal of Peace Research 31(3): 241–246. Hainsworth, P. (2008). The extreme right in western europe. Abingdon, New York: Routledge. Hainsworth, P. (ed.). (1992). The extreme right in europe and the uSA. London: Pinter. Hainsworth, P. (ed.). (2000). The politics of the extreme right. from the margins to the mainstream. London, New York: Pinter. Hilbe, J.M. (2014). Modeling count data. Cambridge: Cambridge University Press. Ignazi, P. (1992). The silent counter-revolution. hypotheses on the emergence of extreme right-wing parties in europe. European Journal of Political Research 22: 3–34. Ignazi, P. (2003). Extreme right parties in western europe. Oxford u.a. : Oxford University Press. Ivarsflaten, E. (2008). What unites right-wing populists in western europe? Re-examining grievance mobilization models in seven successful cases. Comparative Political Studies 41(1): 3–23. Jackman, R.W. & Volpert, K. (1996). Conditions favouring parties of the extreme right in western europe. British Journal of Political Science 26: 501–521. Kitschelt, H. (1995). The radical right in western europe. a comparative analysis. Ann Arbor: The University of Michigan Press. Knigge, P. (1998). The ecological correlates of right-wing extremism in western europe. European Journal of Political Research 34: 249–279. Lipset, S.M. & Raab, E. (1971). The politics of unreason. right-wing extremism in america, 1790-1970. London: Heinemann. Long, J.S. & Freese, J. (2014). Regression models for categorical dependent variables using stata (3rd ed.). College Station: Stata Press. Lubbers, M., Gijsberts, M. & Scheepers, P. (2002). Extreme right-wing voting in western europe. European Journal of Political Research 41: 345–378. Meguid, B.M. (2005). Competition between unequals: The role of mainstream party strategy in niche party success. American Political Science Review 99(3): 347–359. Merkl, P.H. & Weinberg, L. (eds.). (1993). Encounters with the contemporary radical right. Boulder: Westview. Merkl, P.H. & Weinberg, L. (eds.). (1997). The revival of right-wing extremism in the 90s. London, Portland: Frank Cass. Merkl, P.H. & Weinberg, L. (eds.). (2003). Right-wing extremism in the twenty-first century. London: Frank Cass. Mudde, C. (1996). The war of words. defining the extreme right party family. West European Politics 19: 225–248. Mudde, C. (2000). The ideology of the extreme right. Manchester, New York: Manchester University Press. Mudde, C. (2013). Three decades of populist radical right parties in western europe: So what? European Journal of Political Research 52(1): 1–19. Norris, P. (2005). Radical right. voters and parties in the regulated market. Cambridge, New York: Cambridge University Press. Rydgren, J. (2007). The sociology of the radical right. Annual Review of Sociology 33(1): 241–262. Small, H. (1973). Co-citation in the scientific literature. a new measure of the relationship between two documents. Journal of the Association for Information Science and Technology 24(4): 265–269. Stanley, B. (2008). The thin ideology of populism. Journal of Political Ideologies 13(1): 95–110. Svåsand, L. (1998). Scandinavian right-wing radicalism. In H.-G. Betz & S. Immerfall (eds. ), The new politics of the right. neo-populist parties and movements in established democracies. New York: St. Martin’s Press. Zeileis, A., Kleiber, C. & Jackman, S. (2008). Regression models for count data in r. Journal of Statistical Software 27(8): 1–25. Zimmerling, R. (2005). Influence and power. variations on a messy theme. Dordrecht: Springer.